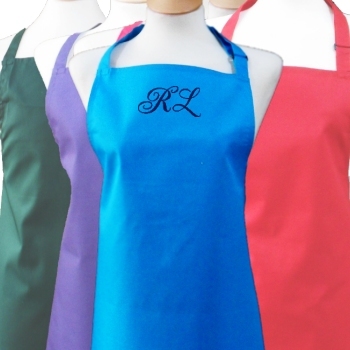 Teal Blue Personalised Chefs Apron with a name, initials or title monogrammed to make a truly special gift. Teal Blue Personalised Chefs Apron with a name, initials or title monogrammed to make a truly special gift. Unique and useful gift idea for men and women and suitable for any occasion, home use or catering! Enter your text. Teal Blue Personalised Chefs Apron with a name, initials or title monogrammed to make a truly special gift. Unique and useful gift idea for men and women and suitable for any occasion, home use or catering! Enter your text. Choose the thread Colour and font style.